The series 6500 Breakaway Panel is the patented Super Seal Seal-union for overhead doors where the bottom panel suffers abuse from accidental impact. 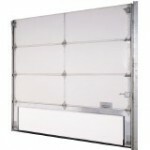 Designed to replace any width overhead door panel, the 6500 Breakaway Panel can sustain very high impact without damaging the panel or the overhead door track. The Breakaway Panel preserves the overhead door structure by flexing under minimal impact and by breaking away under severe impact. Its durable materials ans excellent design make the 6500 Breakaway panel service free .